SURF’S UP – AT MUNICH AIRPORT! 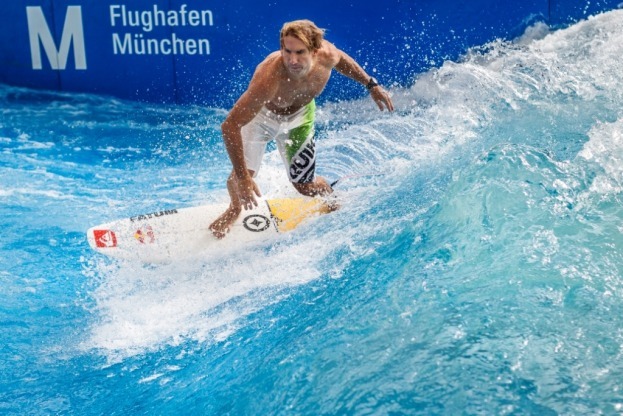 Wetsuits and surfboards are standing by at the ready, at – er – Munich Airport. Even though the nearest shoreline is 500 miles away, this pop-up beach stretched between two terminals enables thousands to catch a wave every year. There’s more to the experience, which runs until August 24, than a giant wave and a few dozen deckchairs. There are three-day surf camps for kids, and serious money to be won by adults, who compete every year in the European stationary wave riding championships. 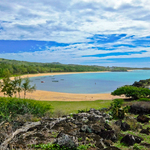 Grandstands accommodate 500 spectators, and those who get the bug can borrow wetsuits and boards free of charge. They will, however, have to book ahead to relive their Point Break fantasies – only 10 people at a time are allowed on the wave, admitted in 45-minute sessions. It’s all very Vorsprung Durch Technik, but the idea of an artificial surf reef was actually born in the UK on a real sand beach in 2009. Sadly, the £3m giant wave simulator in Bournemouth had to close after just two years following damage from a ship’s propellor. The town council, who funded the audacious attraction, finally got their insurance pay-out, and the reef is scheduled to reopen next year. For urban Europeans stranded far from balmy beaches, however, recreating the resort life is more about imported sand, pretend sea and tropical bars than surfboards, and the continent’s urban beach concept is spreading across the globe. It started in 2002 with Paris-Plage, which now has several locations and a shuttle running between one Seine-side “beach” and the next. In Berlin thousands troop to the Badeschiff – a giant ship anchored in the river Spree. Here, bathers swimming in the hulk mingle with barflies lining the deck. The area is surrounded by at least 30 bars packed with Pilsner-drinkers in flowered shirts, and DJ’s move in at night to lay down a soundtrack to Europe’s biggest summer party..
Brussels, Amsterdam, Copenhagen, Vienna, Madrid and Prague have all followed Paris, and London alone has seven different urban beaches. The concept is fast spreading across the globe – Shanghai, Toronto and Montreal have already bought into the dream, and even Detroit’s regenerators are taking a look. Midwestern parrot heads, hold that thought!